** Minimum $200. On approved credit. Terms and conditions apply. 1 3% earn rate applies to the first $12,000 in annual spend at grocery stores with Mastercard merchant code 5411. Excludes purchases at Walmart, Walmart Superstore and Costco. After that, your earn rate will be 1%. For examples of qualifying grocery merchants, visit triangle.com/merchants. Annual spend is based on a calendar year of January 1 - December 31. 2 CT Money is collected on the number of whole litres of fuel purchased when you show your Triangle card, mobile App or key fob and pay with cash or debit. Rate subject to change and could vary by location, see local gas bar for details. Not all Gas+ locations have premium fuel. Must go inside kiosk to collect rewards with App or key fob. 3 Concierge Services are services only, not insurance benefits. These services are provided by Assurant Services Canada Inc. 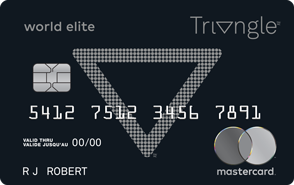 Details are provided in the Statement of Services included in the Triangle World Elite Mastercard welcome kit. 4 Purchase Security, Extended Warranty and Car Rental Collision/Loss Damage Waiver Insurance are insurance coverages underwritten by American Bankers Insurance Company of Florida (ABIC) under Group Policy CTB0418, issued by ABIC to Canadian Tire Bank. Details of the coverage, including definitions, benefits, limitations and exclusions, are outlined in the Certificate of Insurance included in the Triangle World Elite Mastercard welcome kit. ABIC, its subsidiaries, and affiliates carry on business in Canada under the name of Assurant®. ®/™ Sport Chek and Atmosphere are registered trademarks of FGL Sports Ltd.
®/™ Mark’s/L’Equipeur are registered trademarks of Mark’s Work Wearhouse Ltd.
®/™ World Elite Mastercard is registered trademark, and the circles design is a trademark, of Mastercard International Incorporated.